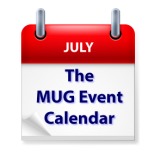 The MUG Event Calendar comes back to full speed this week, with an appearance by David Sparks of Mac Power Users at a California group, tips and tricks on 1Password at a Florida group, and Picnics for New Jersey, New York and Virginia groups. Other topics for the week include iOS, Photos, security, essential apps and games, a WWDC wrap-up and more. Saginaw Macintosh Users Group – Malware???? Adware??? Viruses??? Infections?? ?